Why, WHY? Masks and Curtains. But why do many actors feel they have to start with ‘Why?’ when it unleashes a whole confusing gamut of unactable facts? Starting with why seems to offer little or no juice, when it comes to playing. What is it that seduces them? WHY? ( Now I am asking why! ) Is it our idealised Method based background as actors? Or our sometimes misguided faith in science where the WHY appears to the outsider to be the only important result? Or is it a desire to make us feel as artists that through exploring WHY first, we are doing something ‘real’ and ‘important’ ‘adult’ and ‘serious’? Anyone who has worked psychophysically knows this process of exploring the piece through Imagination and body is every bit as serious and a lot more demanding than an intellectual poring over the script at a table for hours where your energy is often finally sapped before you get up to work. A brilliant example of the dubious nature of WHY was Simon Russell Beale’s discussion of his performance of King Lear [The RNT production] where he suggested Lear might have some kind of Alzheimers . Who cares? In this case the WHY actually diminished his performance in my opinion. I am not suggesting that actors and directors ignore WHY but explore it later in the process. In ‘real life’ we can know why something happens without having any real understanding of it. Nowhere is this more true than in the academic approach to theatre when students are sometimes encouraged to believe they can go out and do it without the real rigours of training. We can understand an approach from a book but without practise and learning through the body we have no experience of it and no learning we can effectively put into practise. Imagine if you read about how to play the violin but hardly did any practise, or learned the rules of basketball assiduously but only played now and again? On March 3rd , my co-tutors and myself at CORE theatre college will be running an intense but part time course for 10 weeks in Galway which will include three performances in May. This course puts the imagination, the body and creativity at the centre of the performers work. The HOW and the WHAT before the WHY. The imagination and the body before the intellect. Teachers are trained in Chekhov and Lecoq and there will also be a voice module. There are only a few places left for this course so if you are interested check out http://www.coretheatrecollege@gmail.com . 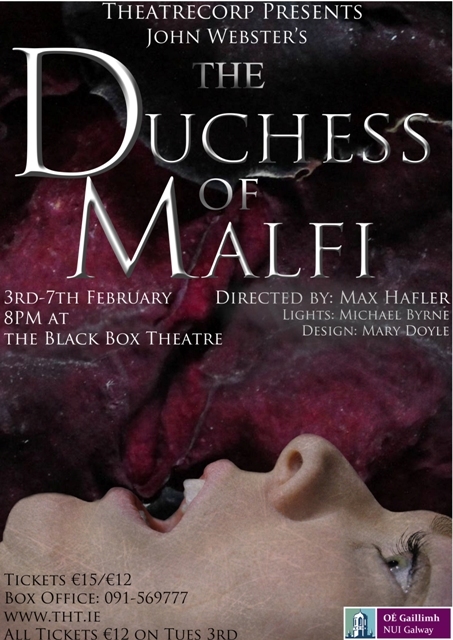 And Theatrecorp’s production of The Duchess of Malfi plays the Black Box Theatre Galway 3rd – 7th February phone 091 569777. This entry was posted in Uncategorized and tagged Core Theatre College, Duchess of Malfi, Michael Chekhov Technique, performance courses 2015, Theatrecorp on January 24, 2015 by maxhafler. After our first exploratory week involving finding atmopsheres, qualities and centres for this extraordinary play, we began this week to apply some of those discoveries to the text. 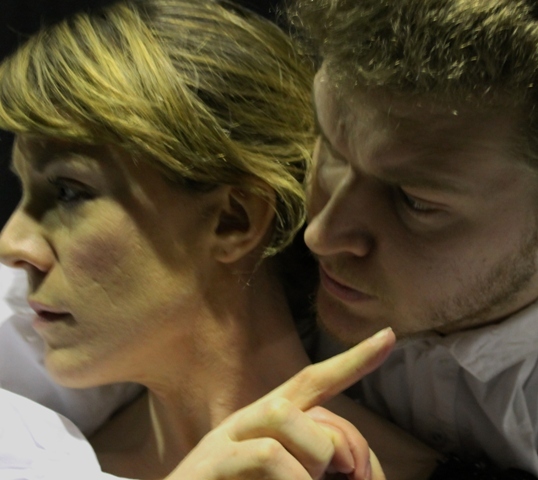 The last two days we have been working on one of the most horrific acts in Theatre , act 4 of the Duchess of Malfi by John Webster, which we are presenting in the Black Box Theatre Galway with an eight strong cast in early February. For those unfamiliar with the play, this act involves the capture and psychological torture of a woman whose only crime is to marry against the wishes of her brothers. With only her waiting woman and her two babies for company, her deranged brother locks her away, then in a bizarre charade pretends he has killed her husband and presents her with a dead hand which she presumes is his. The brother then sends her inmates from an asylum to attend on her. They taunt and molest her, and then finally there is a disturbing charade at the end of which she , her waiting woman and her two babies are murdered. After working on this act on Thursday, we actually discussed the possibility of having ten minutes relaxation/ debriefing or whatever after we rehearsed this scene, the intensity of it was so profoundly horrible. To those not familiar with theatre and the depth of the work, most particularly when rehearsing and working with different qualities and atmospheres, often doing sections of a gruesome scene over and over,this can sound a bit precious, but it actually isn’t . When working with the body and imagination, powerful feelings flow through you. Even though it flows through , it can also leave a residue and this needs to be considered. Act 4 has the atmosphere of a torture chamber. When I watched this scene for the first time today, I realised something. The brother and his lieutenant who have facilitated this torture and murder sit empty and exhausted near her murdered body and start to argue and blame each other for her death. By the end of the scene , I realised that both men were completely destroyed by their actions; how Webster understands that violence destroys the perpetrators as surely as it does the victims. It made me think about the violence in France this week. Someone said to me how much they loved the play because of the bloodbath ; so often the play is dismissed as some kind of Jacobean soap opera. However, for me this is a deeply political and moral play about decay, corruption and what can happen to those who refuse to bow to it. The gruesome poetry is magnificent. The cynical realisations of the characters are not so far from our own, and given the society in which we live the so-called excesses of the play are not at all far fetched. It is grotesquely funny in places, juxtaposing the deep downward feeling of tragedy and pain with a kind of wriggling upward struggle for energy and life, as if they are all trying to escape from a trap. One image in the poster of a decaying rose reminds me of how things die, pass and change, and against that backdrop how we endeavour to take our breath . This entry was posted in Uncategorized and tagged Duchess of Malfi, Rehearsal process, Theatrecorp on January 10, 2015 by maxhafler.